Those box-office numbers could get a boost now that the anti-Obama doc has scored a high-power endorsement from conservative media mogul Rupert Murdoch. The embattled News Corp. chairman gave 2016: Obama's America his thumbs up via Twitter, even as questions arise about the veracity of the film's assertions. Just saw 2016. Truly scary if no answer. Every voter should see and decide for self what future they want for America. Obama's America is based on Dinesh D'Souza's 2010 New York Times-best selling book The Roots of Obama's Rage. D'Souza and John Sullivan co-directed and co-wrote the film, and the filmmakers said that Murdoch asked for a screener of the film, according to The Hollywood Reporter. 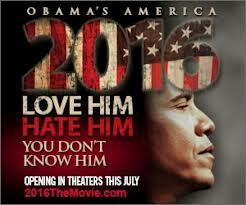 In part, the film scrutinizes Obama's Kenyan-born father and his alleged anti-colonialist views. (What is now Kenya gained independence from Great Britain in 1964). The elder Obama's views, according to D'Souza, explain why President Obama rejects "American Exceptionalism" and why the author-filmmaker believes he is aiming to "re-shape America" by reducing the U.S.'s overall global reach and influence. According to the AP, 2016: Obama's America also asserts the president's views were reinforced by his upbringing in Hawaii, which was effectively annexed by the U.S. after the overthrow of its monarchy in the 1890s. Obama's father left his family when Barack was just 2 years old and visited only once when the future president was was 10, the AP reports, but D'Souza's film argues that this absence actually reinforced the son's ties to his father, who died in a car accident when Obama fils was in college. D'Souza interviews NYU psychologist Paul Vitz who studies the impact of absent fathers. Vitz says the void meant that "he has the tension between the Americanism and his Africanism. He himself is an intersection of major political forces in his own psychology." 2016 also delves into a host of issues ranging from the Federal Deficit to Obama's supposed "weirdly sympathetic" leanings to Muslim jihadists. While the debt has grown by $16 trillion under Obama, the film fails to mention the 2008 global financial crisis that preceded it under his predecessor, George W. Bush. And it does not mention his order to kill Osama Bin Laden in May 2011. Haven't seen it, but a political documentary that twists facts? Color me shocked. The Pres. was raised by some people who did not really embrace the U.S. or its system. It's not a bad thing, but let's not deny it happended. And you clearly already believe, so why are you shelling out $10? These are the types of people who are a female President away from moving to Idaho and joining one of those gun-happy splinter groups. Color me shocked. The Pres. was raised by some people who did not really embrace the U.S. or its system.I am beautiful woman and I love good man…..inter racial romance is my dream… so I joined —blackwhitеPlanet.С0M—–it's where to- connect with beautiful and excellent people! elieve what they want to believe, if you pay to see 2016, I think I know what you want to believe. I like the words!! Not only will a complete guide enable you to have the six pack abs you would like, but it’ll also build your character and improve your wellness. The methods described inside the guide contain detailed instructions and comprehensive discussions on how to execute each and every step. Copyright © 2018 PMC. All rights reserved.